The 4Noah VCS utility by William Pilgrim is designed to make a range of emulated Atari VCS console games playable using the SPACE BAR alone. These games were never designed to be played in this way so you will need a little patience whilst initially getting set up. You can find an excellent Atari emulator for PCs over at the the ATE Arcade alongside a list of good games and where to find them. This utility can also be used with any PC game that has keyboard controls that can be reconfigured and that can be played in windowed mode. By setting a single accessibility switch to act as the SPACE BAR previously inaccessible games can be made accessible to some disabled gamers. The video clip below shows clearly how the 4Noah VCS utility works in practice. The video clip above demonstrates Space Invaders being used with 4Noah VCS. Tapping the SPACE BAR toggles between LEFT, STOP, RIGHT, STOP. Holding the button fires. Atari Bowling works in a similar way but toggles between UP and DOWN. Download the Atari VCS emulator: Stella. Download some games to play on the emulator. Save them into the ROMS folder. Run then configure Stella via the TAB key. Click on "ROM Path" then point to where your "ROMS" folder is. Click OK.
"P0 Joystick Up" - click on "Map" then press "Erase" then "Map" then press "W"
"P0 Joystick Down" - click on "Map" then press "Erase" then "Map" then press "S"
"P0 Joystick Left" - click on "Map" then press "Erase" then "Map" then press "A"
"P0 Joystick Right" - click on "Map" then press "Erase" then "Map" then press "D"
"P0 Joystick Fire" - click on "Map" then press "Erase" then "Map" then press "Z"
"Fry Cartridge" - press "Erase"
"Enter ROM launcher" - "Map" then "Erase" then "Map" then "backspace"
Download the 4Noah VCS utility then unzip it. If you are using an accessibility switch, ensure it is set to trigger the SPACE BAR. To make a quick test to see if all is working correctly, open up a Notepad window (Word would be fine too). Start 4Noah VCS by double clicking on its icon. 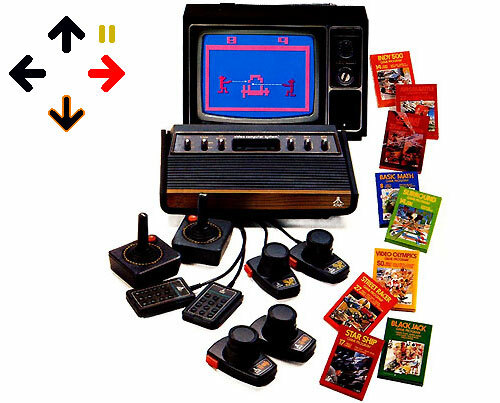 As demonstrated in the video above, click on a vertical or horizontal arrow to select the respective mode then press PLAY (top right small green arrow). You should quickly be able to enter text characters by pressing the SPACE BAR. Close this window down then press ESCAPE to quit. Start the Stella emulator. Find a game you wish to play, then start it. Start up the 4Noah VCS utility. Select if you want the UP/DOWN mode or LEFT/RIGHT mode and also decide if you want manual or auto-firing as explained in the video above. PLAY! To pause or restart 4Noah VCS press ESCAPE. Press ESCAPE again to quit. Use F1 to select an Atari game variation. Use F2 to start a game. Use TAB to bring up the configuration screen. Press BACKSPACE to try a new game. Air-Sea Battle (try game 7); Asteroids; Combat (try Jet games 21 to 27); Galaxian; Phoenix (use auto-fire); Space Invaders (use auto-fire); Robot Tank (very hard). Air-Sea Battle (try game 14); Bowling; Combat (try Bi-play games 15 to 20); Outlaw. N.B.You should play games in windowed mode as the 4Noah VCS utility can not presently be minimised. If you do not you may get a nasty on-screen flicker.